Having a process in place to attract, develop, motivate and retain the best and brightest people for your business is the smart thing to be doing and helps you mitigate the risks detailed above. During the recruitment process – a lot is taken on trust. Everyone recognises that to get through the door – the contents of the CV are vital and that can lead to a little “embellishment” to improve one’s chance so it is vital that proper due diligence is carried out. Make sure you are clear on what the requirements of the job are and write these down. What knowledge and skills are needed to do the job (give some consideration to your future plans for the business) and what sort of attitude do they need to work well with you and the existing team? In smaller businesses, the impact of a poor fit in a team can be felt swiftly and could upset the harmony and balance of your business – so this is a vital consideration. To avoid over-inflated CV’s – think about using a standard application form – it makes it harder for employment gaps to be hidden and ensures that you are looking at like for like information when deciding who to call for interview. When making your decision about who you want to see – make notes on why you deselected those that you have discarded. This is important as you may need to rely on this information if you are faced with a challenge by a disgruntled applicant. Write down some questions that will enable you to test the candidate’s knowledge, skill and experience. Using the same questions for each candidate also ensures consistency which is great to show that each applicant has been treated fairly. If your role requires expertise in a particular area then do not be afraid of asking ‘technical questions’ during the interview to test their experience. Ask candidates open questions and encourage them to provide examples of when they have shown a particular skill. Use the interview as an opportunity to engage the candidate in why you are a great place to come and work. Share with them your vision and values for your business – this enables them to see what you offer as an employer. We would also recommend a tour of the workspace and the opportunity to meet some of your current employees. One of the questions that they want to know is why you are recruiting for the role now. There is nothing more exciting than joining a business that is growing because it is successful. By sharing your passion for your business – it will get them excited about the possibility of coming to work for you – this is a vital element to get the new employee on board and productive as swiftly as possible. Remember that even if the candidate may not be right for the role that you are recruiting for at the time, they could be right for another role in the future or have friends or family who are or could become your customers. Take thorough notes from each interview and keep them. They may have to be used in evidence should a disgruntled applicant make a claim. Please ensure that all comments remain professional. Interviewing is a skill that not everyone has. 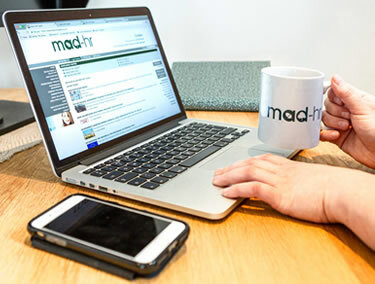 MAD-HR can offer businesses support when interviewing by sitting alongside the recruiter or run training courses for recruiting managers to ensure that the process will be fair and consistent and help them to improve their ability to select great candidates. Always make sure that you request to see the candidate’s original examination certificates, passport and driving licence (if this is a requirement of the role). Consider carrying out independent background checks to verify employment history, qualifications etc. Take written references. Try to call the writer to verify that the reference is valid. Often former employers are more willing to speak on the telephone and ‘off the record’. It is also not unheard of for employees to get friends to write references for them rather than the HR department or their manager, or to write their own reference using their employer’s headed paper. Recruiting is a great way to meet new people and when done right it can strengthen your business as you cannot keep doing everything yourself. If you need help, then MAD-HR are there to support you as much or as little as you need. We are not a recruitment agency but we want to help businesses get better at finding and retaining talent for their business. We will talk through all of your HR support options and make sure you get the service that's right for you and your business.